was hard to breath. It was so hot that our unheated pool felt like bath water. 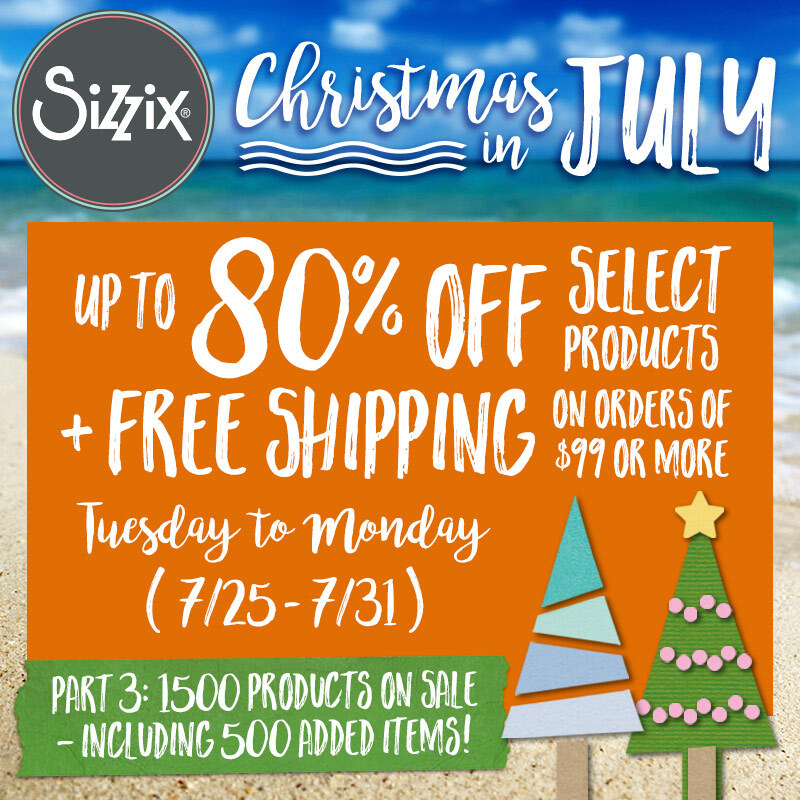 Summer’s in full swing and vacation (for me) is fast approaching. 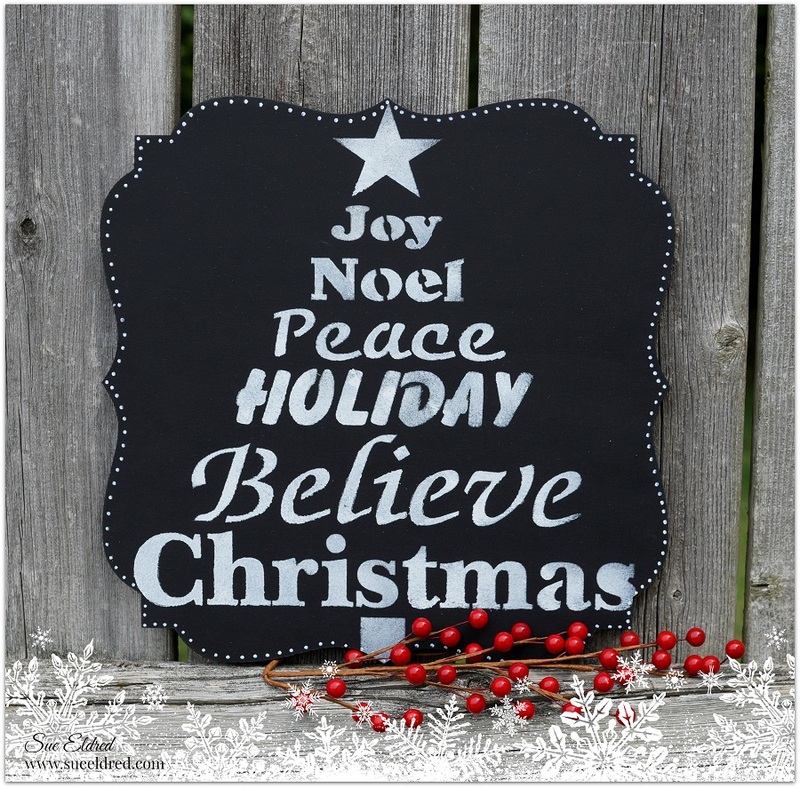 And with all the things I could or should be doing, I felt like making a Christmas Chalkboard. It’s not too early? Is it? 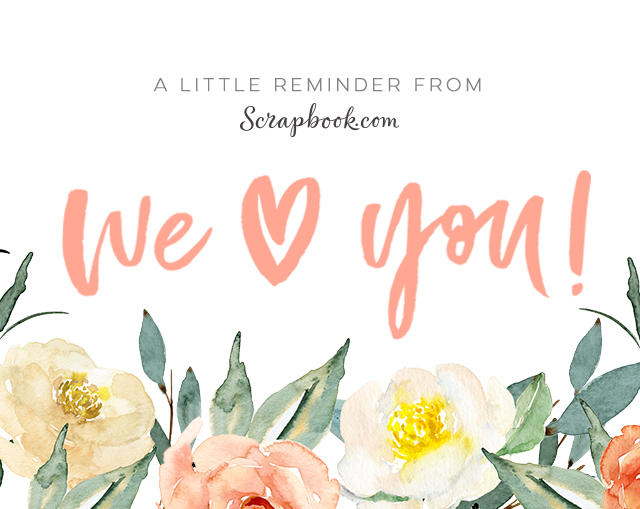 and would be a wonderful gift for those of you thinking ahead. 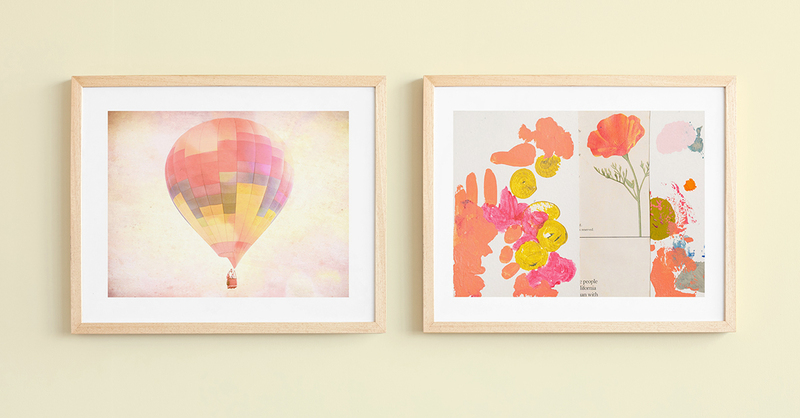 And if you’d like…you could make it a two sided chalkboard and really get creative. 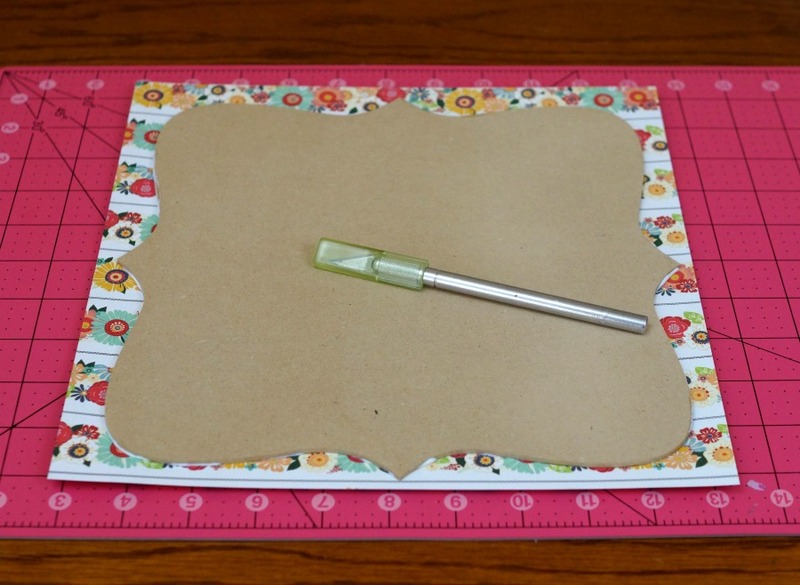 Use a DecoColor Fine Point Paint Marker* to add small white dots around the edge of the chalkboard. 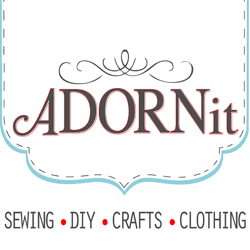 An another idea…. drill two small holes on the top of the sign to add twine for hanging. 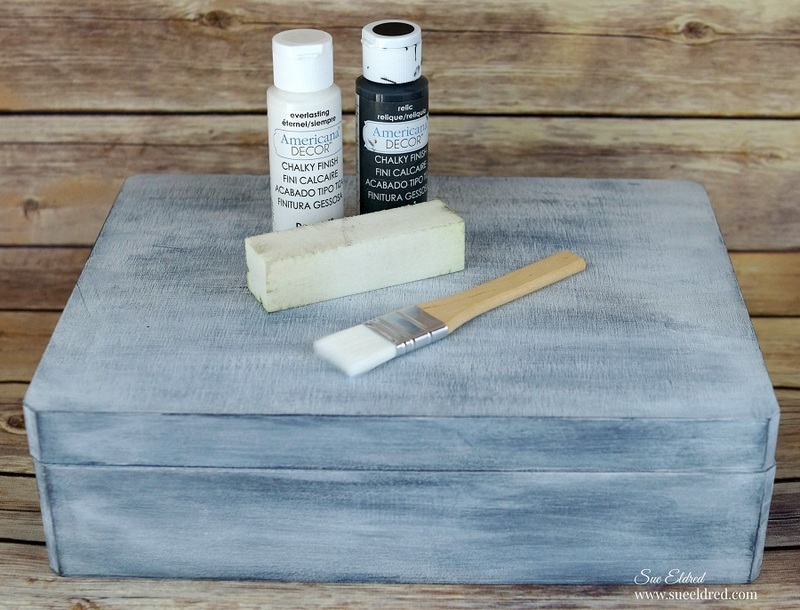 How to create an Easy Pickled Finish with Vintage Effect Wash from Deco Arts. 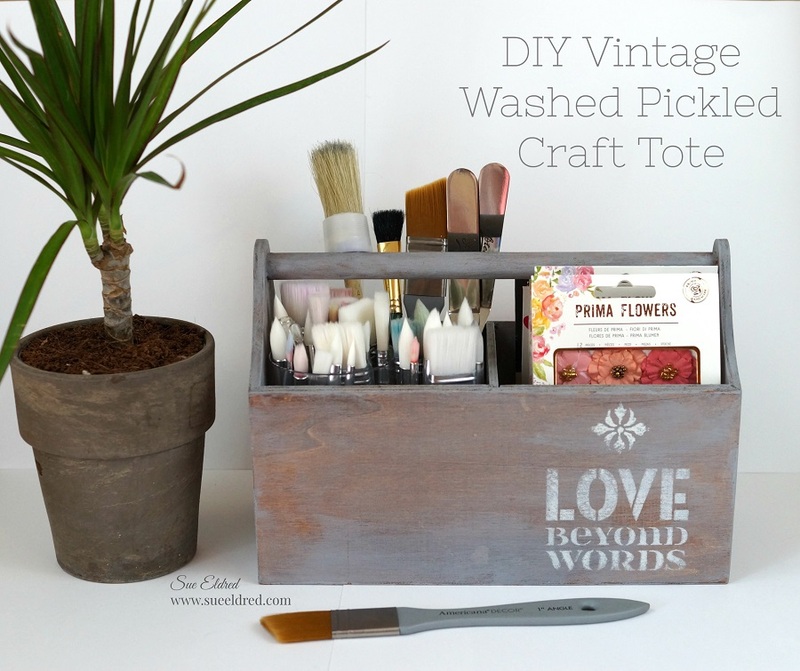 I had this unfinished wood tote that I wanted to use the new Vintage Effect Wash on. My first thought was to just give the tote a cool white wash using the paint. staining it with a Walnut Gel Stain first. I love the way it turned out. 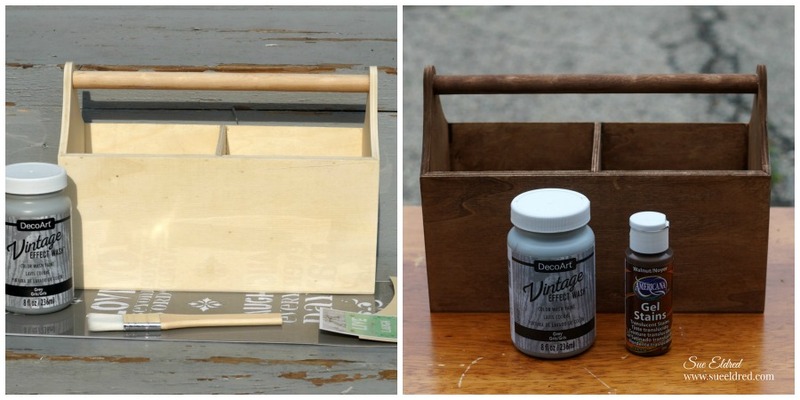 This would make a great garden tool holder, picnic caddy, or my favorite…a Craft Tote. Lightly sand the wood crate if necessary. 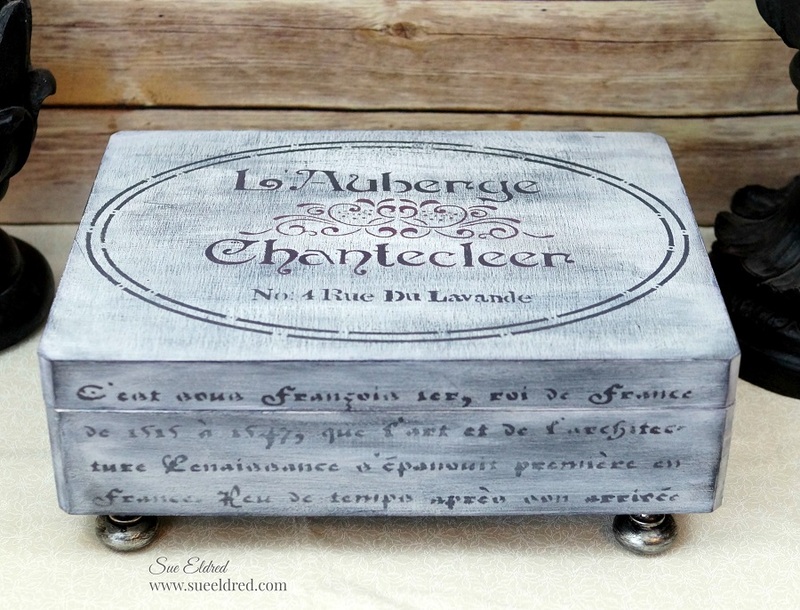 Paint or brush crate with DecoArt Americana Walnut Gel Stains Paint*. Rub off excess stain with soft clean rag. Allo w stain to dry. 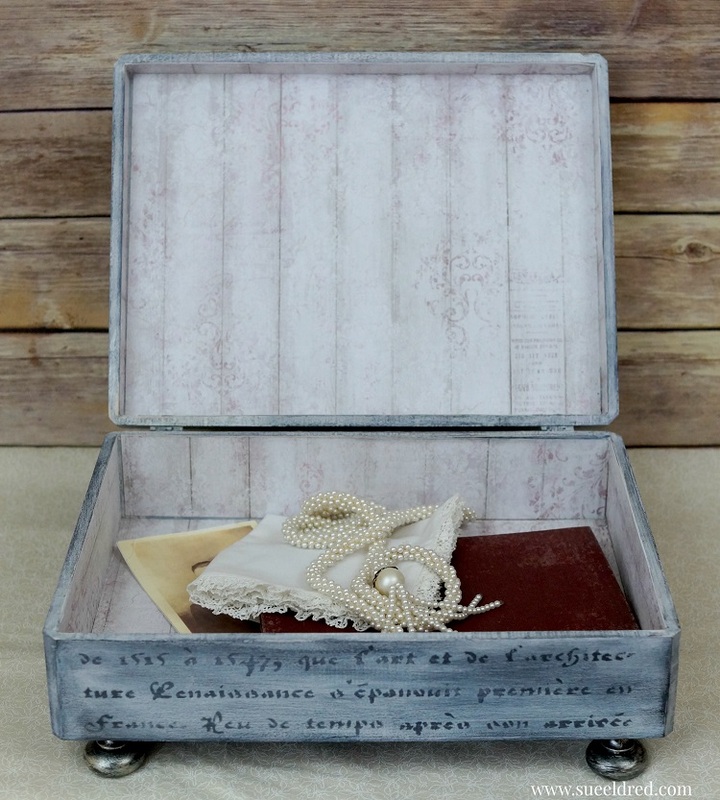 If desired, add stenciling onto the crate. Apply a sealer to protect the finish. 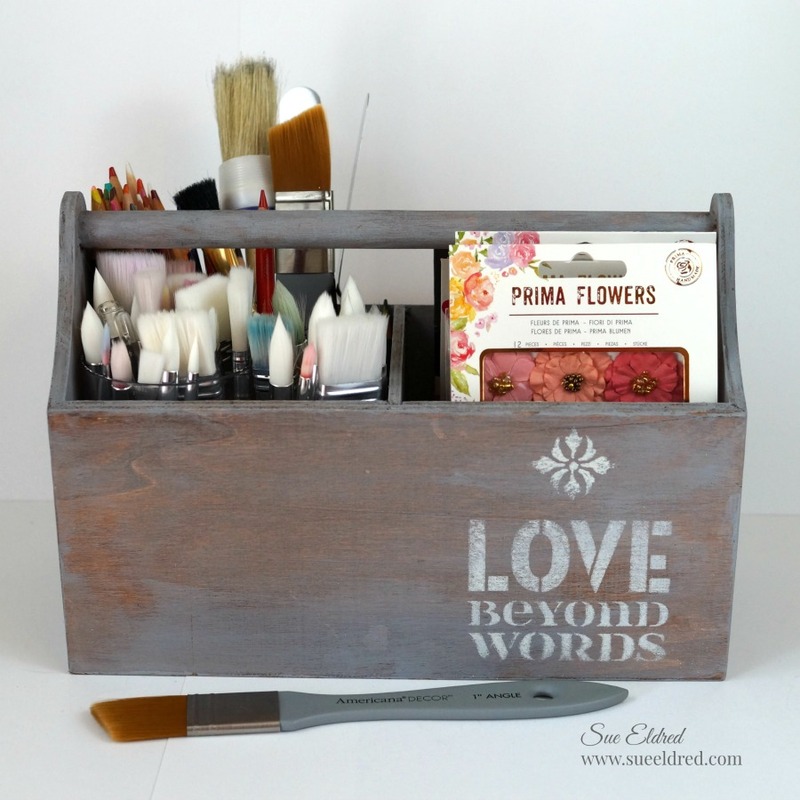 The Love Beyond Words Pickled Crate was sponsored by DecoArts. 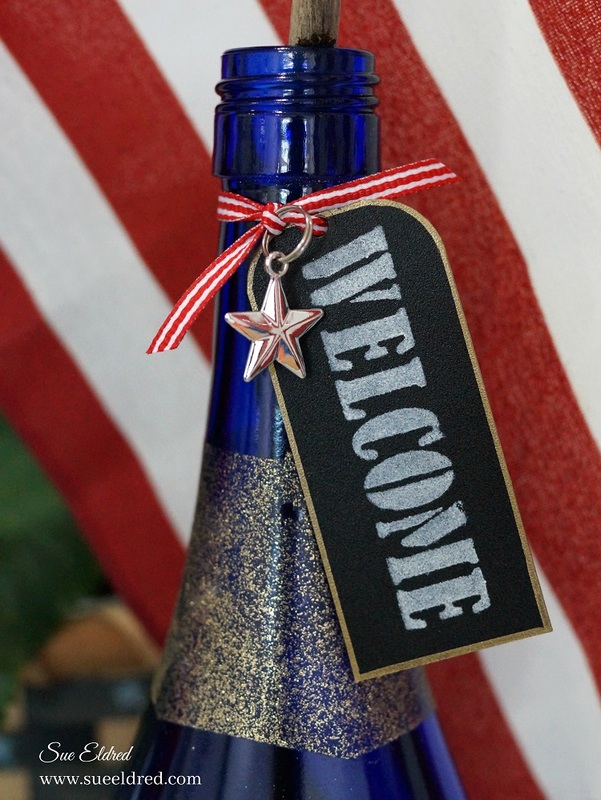 Celebrate the holidays with a Red, White and Blue Etched Wine Bottle. 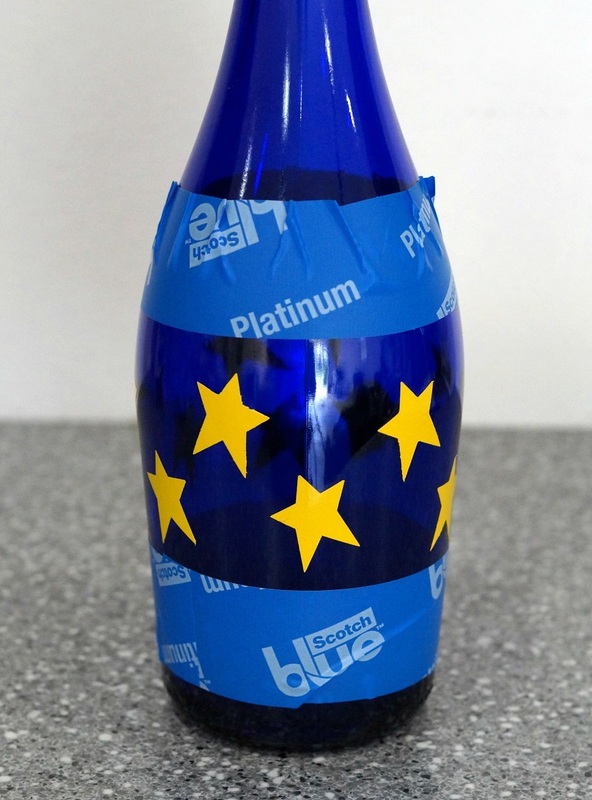 have an empty blue wine bottle. I thought to myself, that would make a perfect vase. 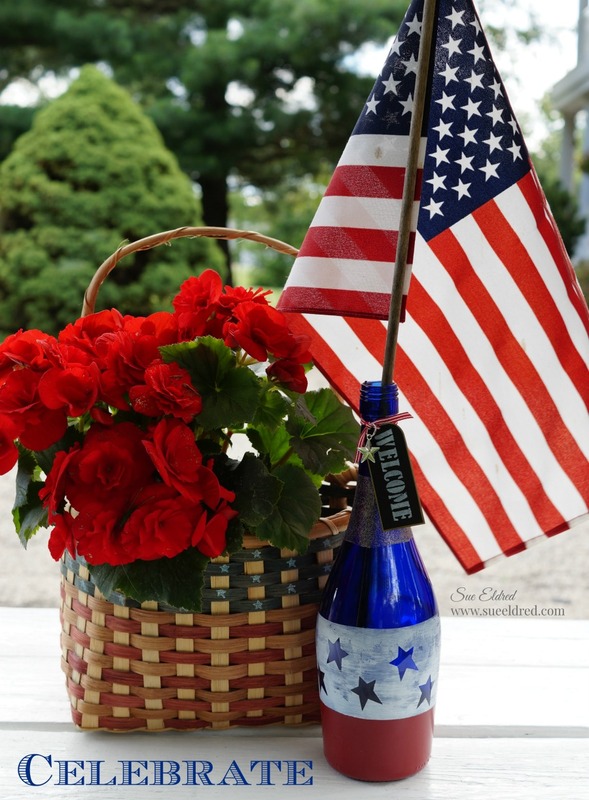 I added red flowers to a 50 cent Garage Sale-Flag Basket and now I have a festive display. 2. Mask off a 2 ½ to 3 inch section on the center of the wine bottle with blue painter’s tape. Burnish the edges of the tape with your fingertip, the tape should lay flat against the bottle. 3. Punch stars out of the etchall etchmask*. 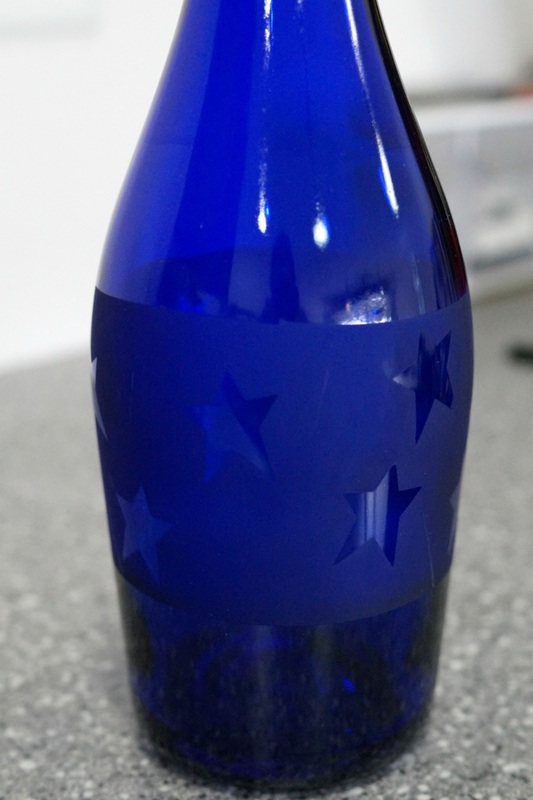 Remove backing from the stars and stick randomly on the bottle. Burnish the stars with your fingertips onto the bottle. 4. 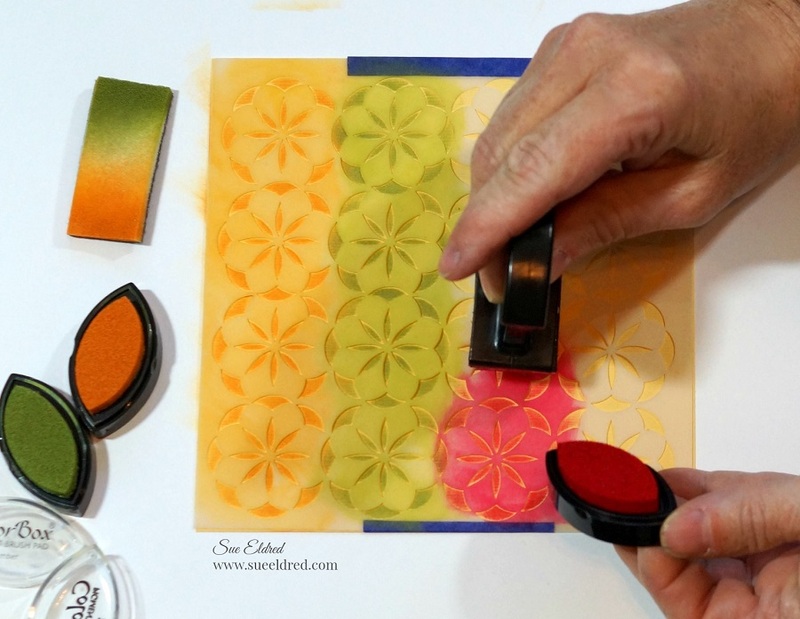 Apply a heavy coat of etchall Etching Crème* onto the bottle using the squeegee. 5. Let crème sit for 15 minutes. 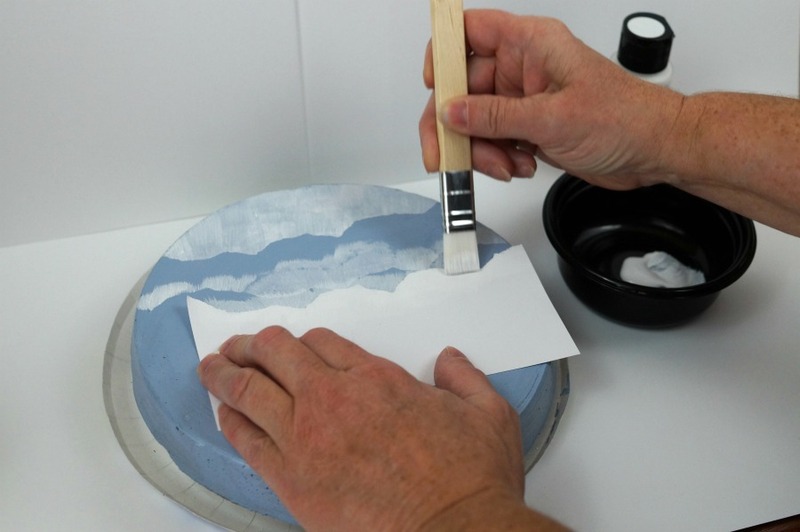 (You will need to keep an eye on the bottle to make sure etching crème doesn’t run past the blue painter’s tape.) Scrape excess etching crème from the bottle and return the extra etching crème back into the bottle. It’s reusable. 6. Rinse bottle with warm water to clean. Remember to keep crème away from porcelain or ceramic tiles. 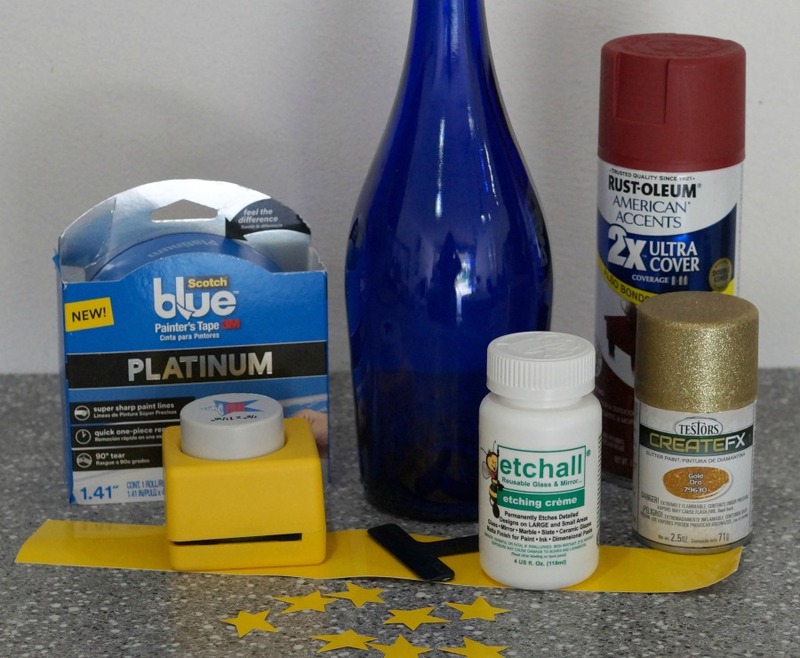 Remove tape and stars and dry. The bottle will have a nice subtle etching. 7. 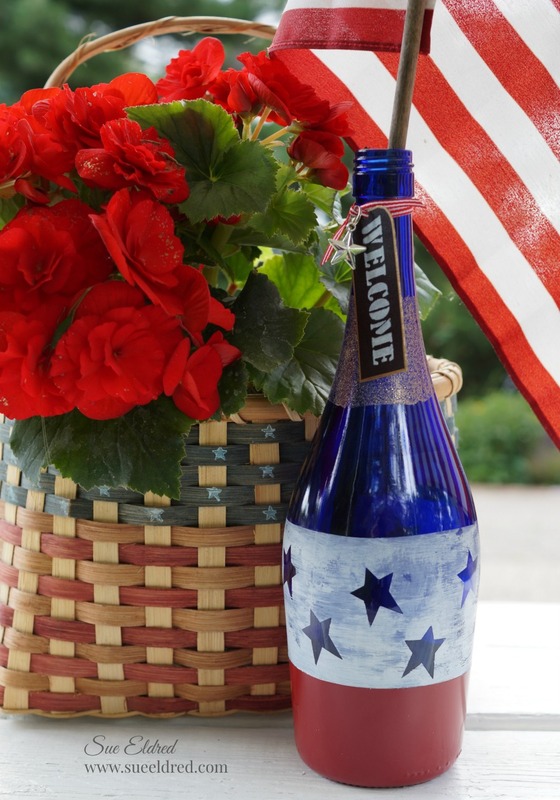 While I liked the subtle look… I decided I wanted something a little bit brighter for my patriotic bottle. I dried brushed white acrylic paint over the etched surface. 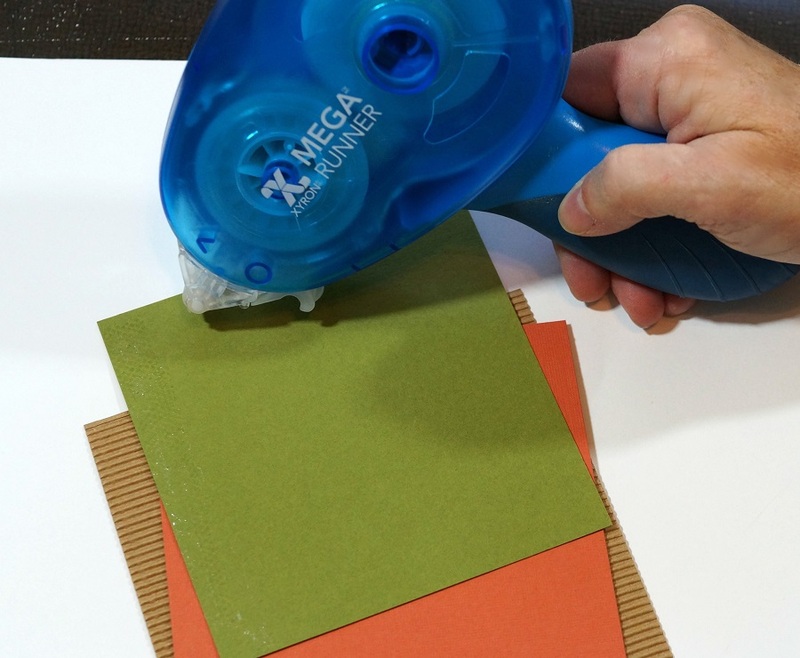 Wipe off excess paint with a damp cloth for a white washed look. The paint only sticks to the etched surface. (How cool it that.) It really makes the stars pop. 8. 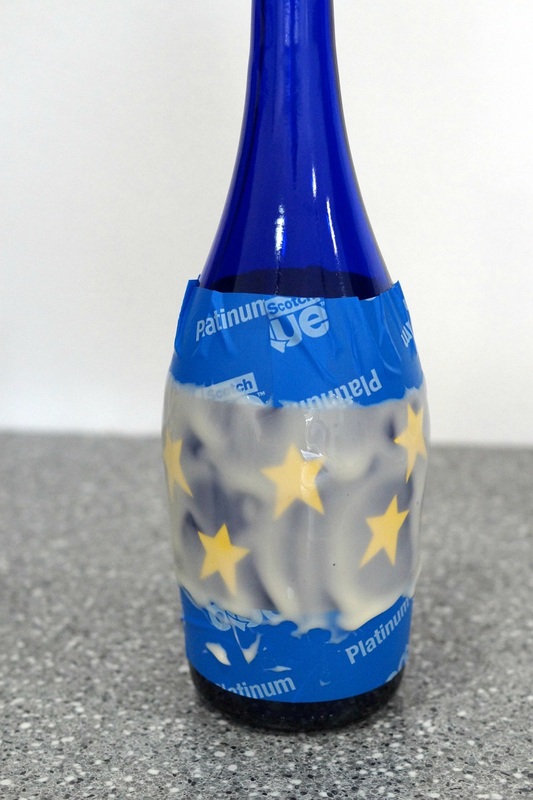 Re-mask the bottle with the blue painter’s tape, this time covering the etched surface. Paint the bottom of the bottle with the colonial red spray paint. 10. Mask a small section on the top of the bottle and spray with gold spray paint. 11. Cut a small black vinyl rectangle and round two of the corners with the corner punch. 12. Stencil the word “welcome” from the family words stencil onto the black vinyl using a stencil brush and the multi-surface acrylic paint. 13. 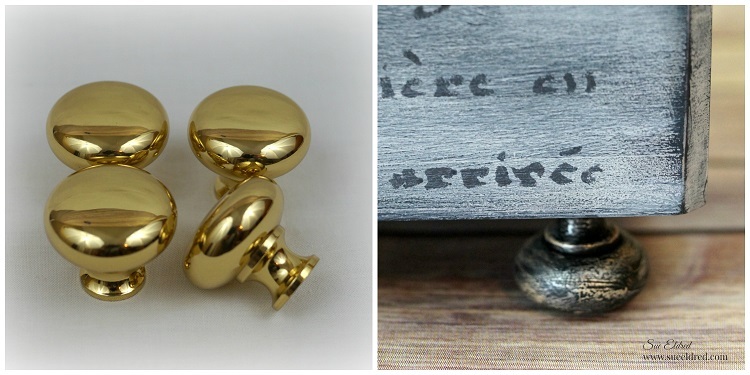 Use the gold paint pen to add a thin border around the black vinyl tag. Punch a small hole on the top of the tag and tie onto the neck of the bottle with ribbon. 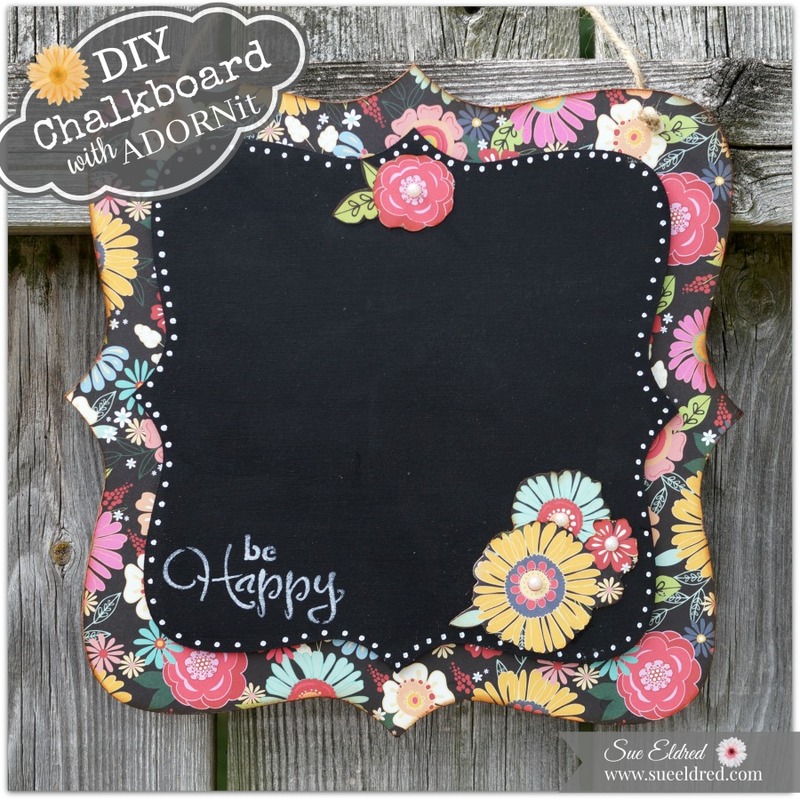 The Floral Chalkboard makes a fun decorative Home Décor piece and is really easy to make. 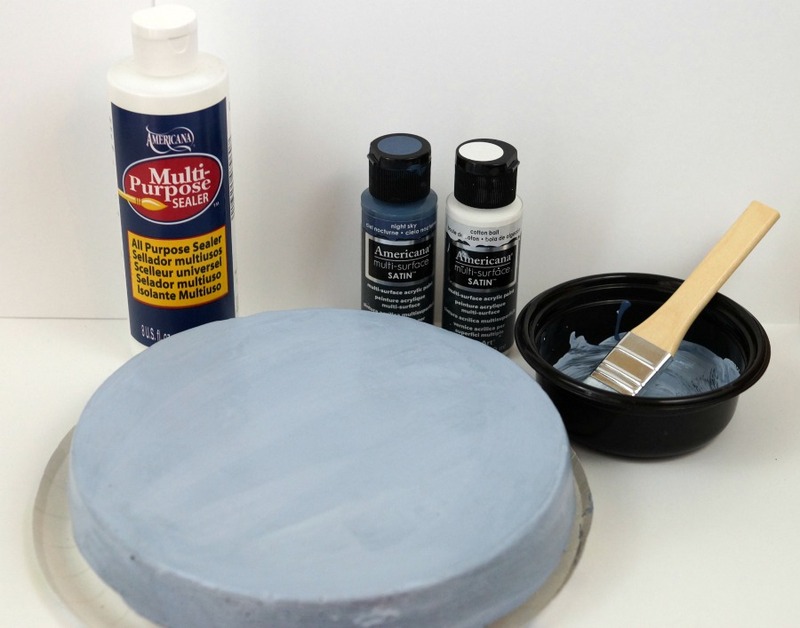 Apply an even coat of Mod Podge* over the larger Wood Bracket shape*. 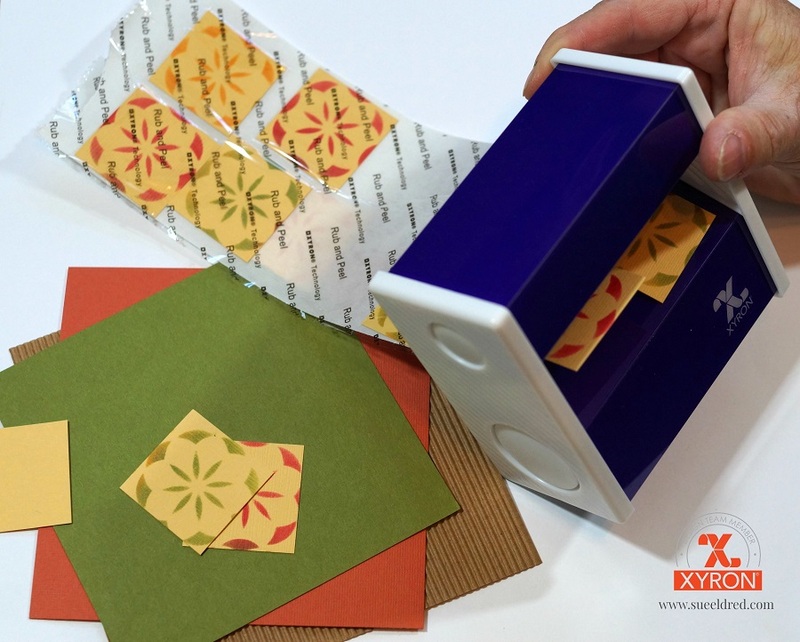 Lay decorative scrapbook paper over shape and smooth with your hand. 2. Using an x-acto knife and cutting mat, cut excess paper away from the Wood Bracket*. 3. 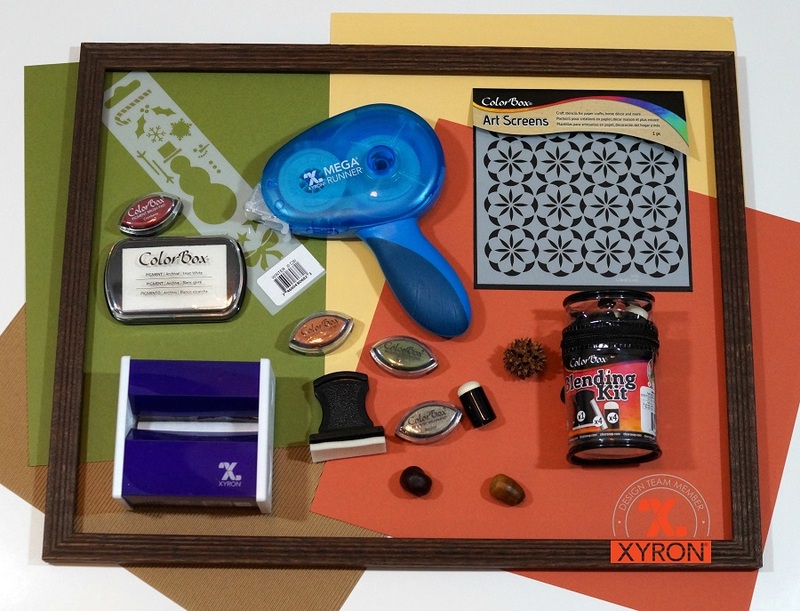 Rub Vintage Photo Distress Ink* onto the outside edges of the wood shape using the Ink Blending Tool* . 4. 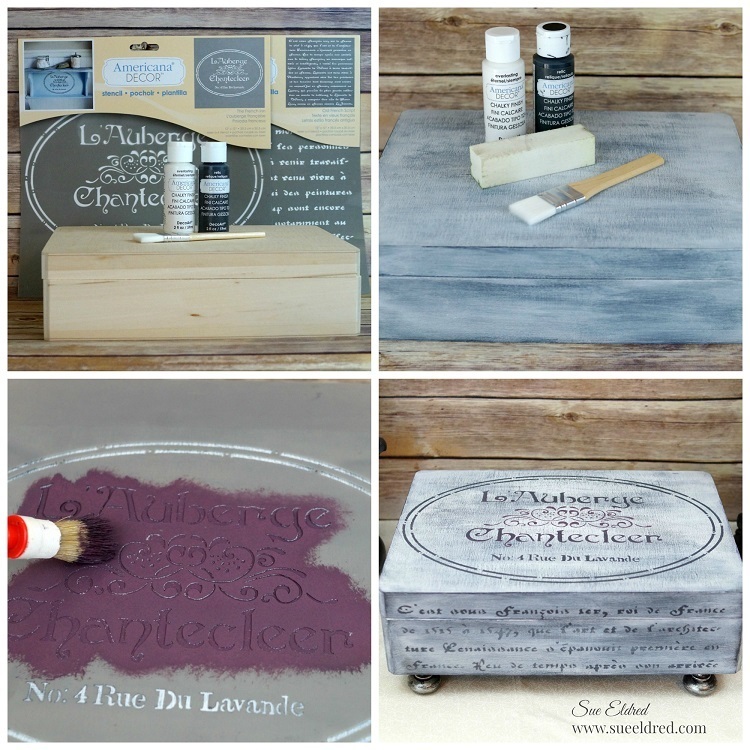 Paint the smaller wood shape with the Black Chalkboard Paint* . 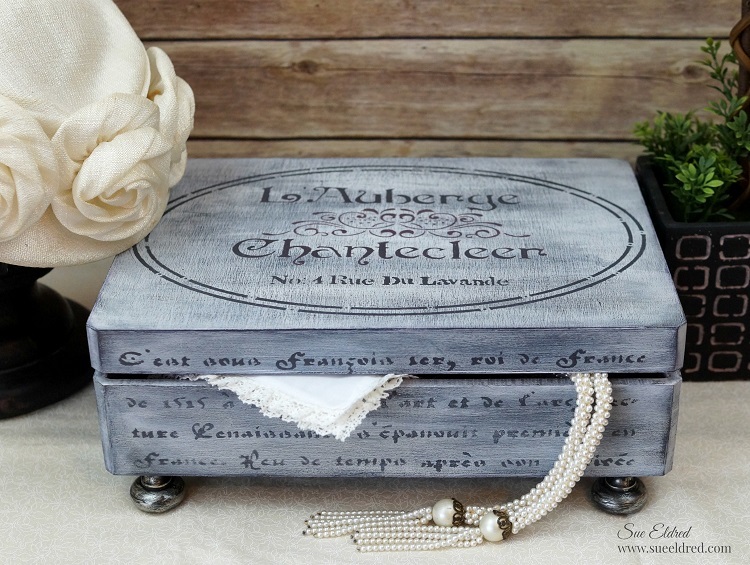 Add small white dots around the outside of the wood shape with the white paint marker* . 5. 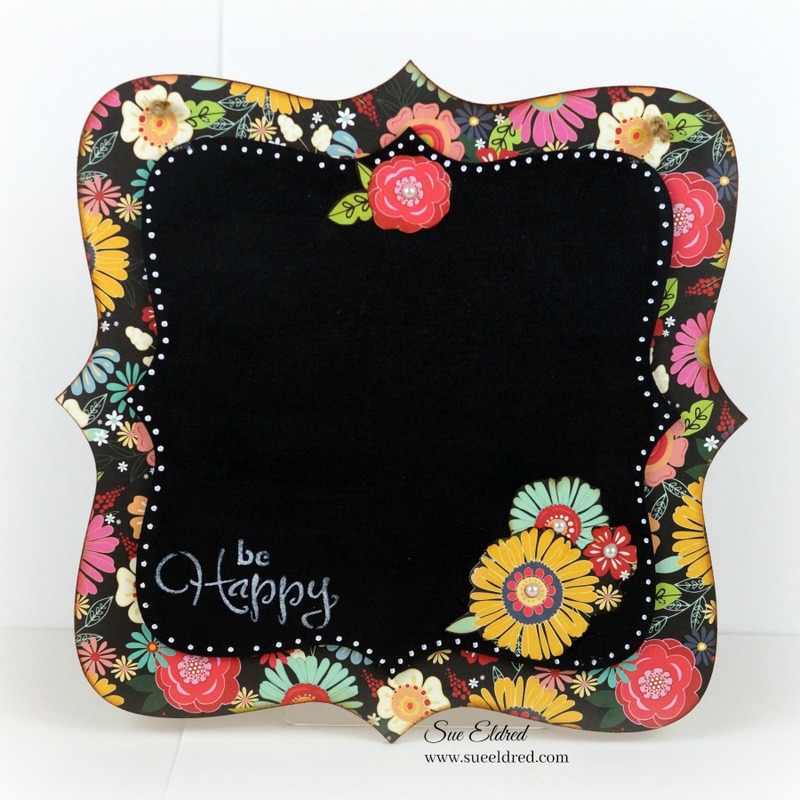 Stencil the words “be Happy” onto the chalkboard using white acrylic paint and the Deco Art Americana Decor Stencil, Inspiration* . 6. 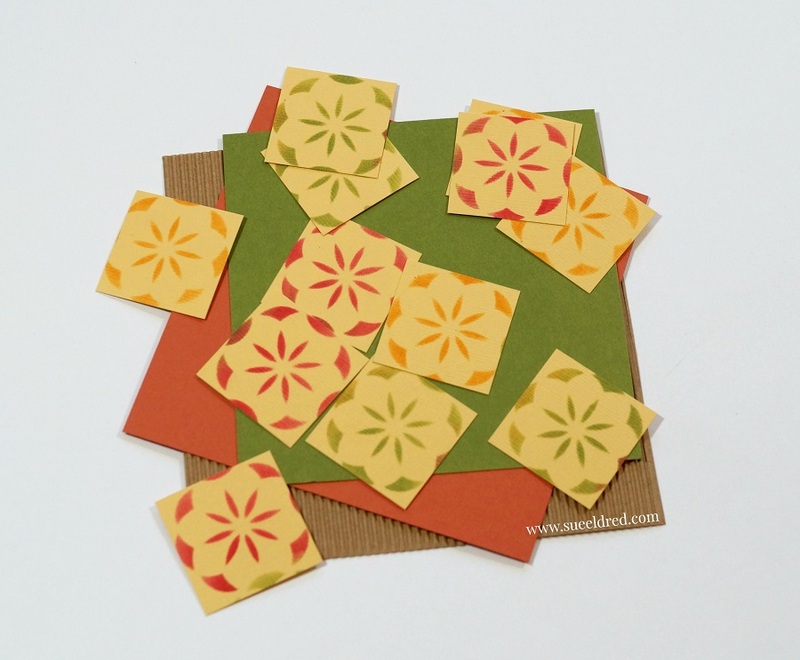 Cut a few flower shapes using the second sheet of scrapbook paper. 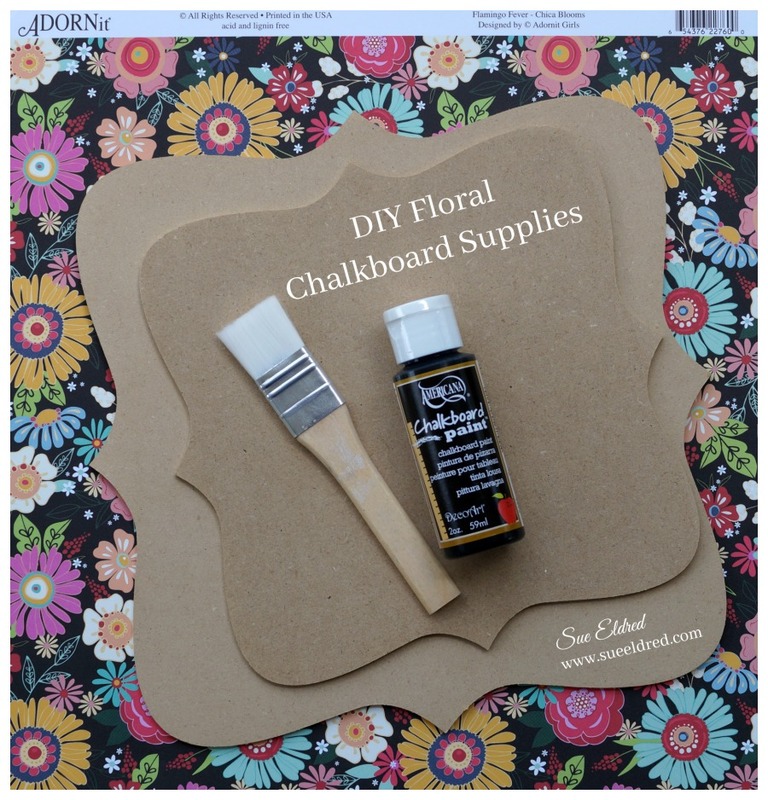 Apply a thin coat of Mod Podge* to the back of the flowers and glue to the front of the chalkboard. Add decorative pearl embellishments to the inside of the flowers. 7. Glue chalkboard to the front of the floral base using Beacon’s Quick Grip All-Purpose Permanent Adhesive* . 8. Drill two holes on the top of the chalkboard and add Twine* for hanging. This Chalkboard was sponsored by as an“it girl” Ambassador. 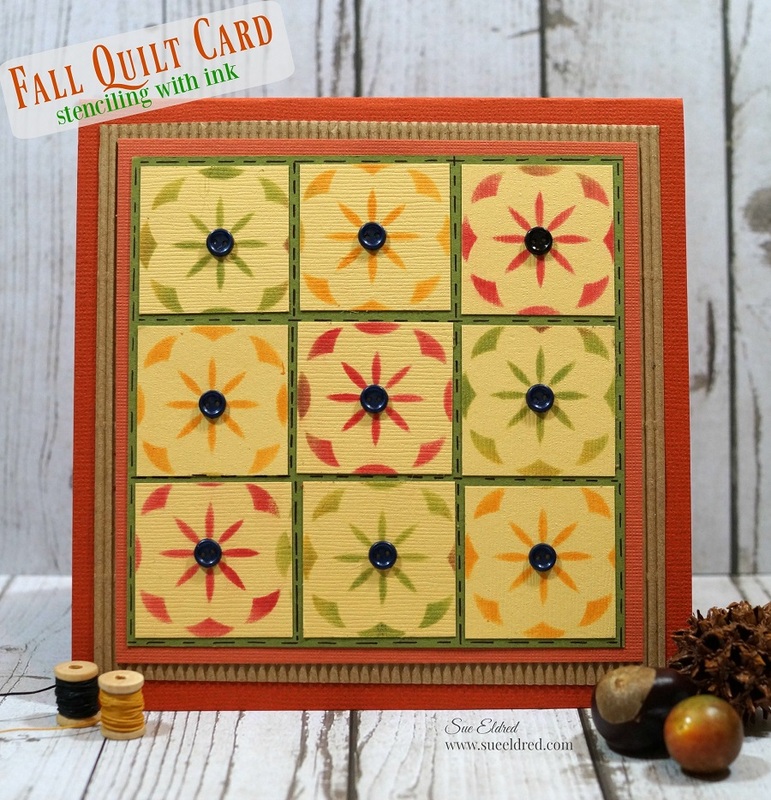 If you liked the Floral Chalkboard, you might also like the DIY Bloom Floral Plaque. 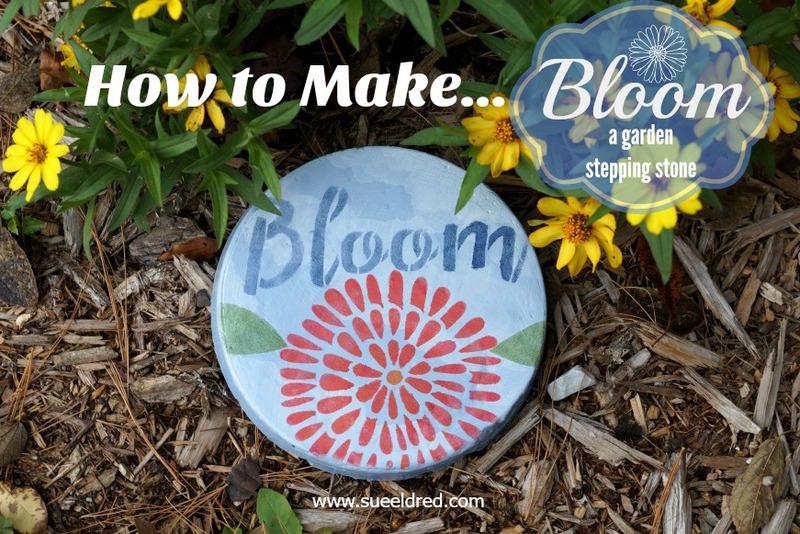 Create a little fun and whimsy in your Garden with a Bloom Garden Stepping Stone. 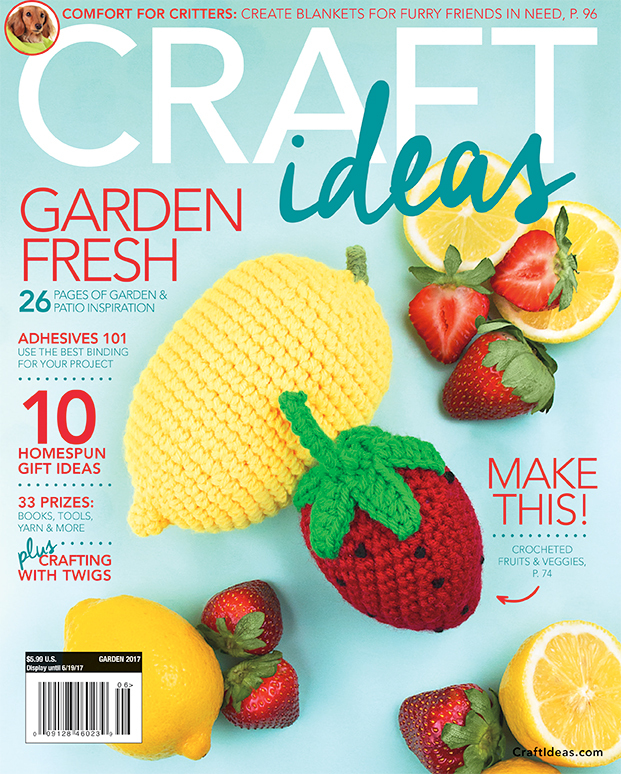 the issue is full of great garden themed ideas and inspiration. 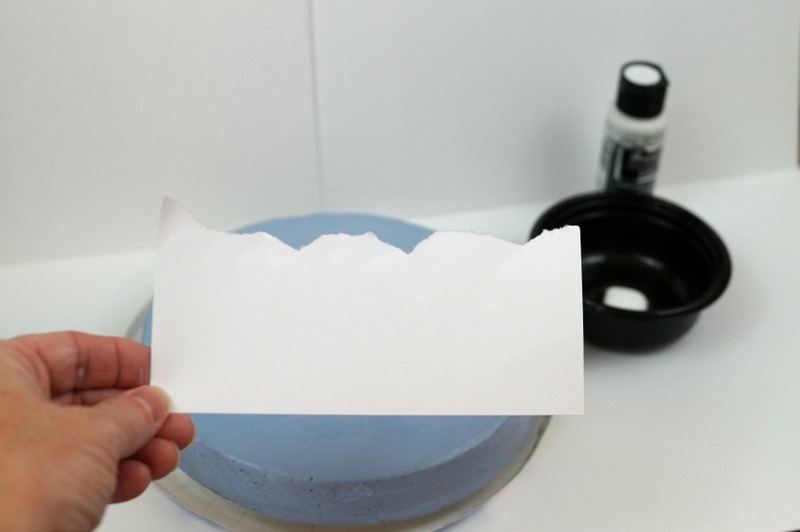 Cover the sides and bottom of an old cake pan with Petroleum Jelly for easy removal. Mix Rapid Set Concrete Mix according to manufacturer’s instructions. Fill pan with cement approx. 1″ thick. Shake pan a little to fill in the gaps and smooth. 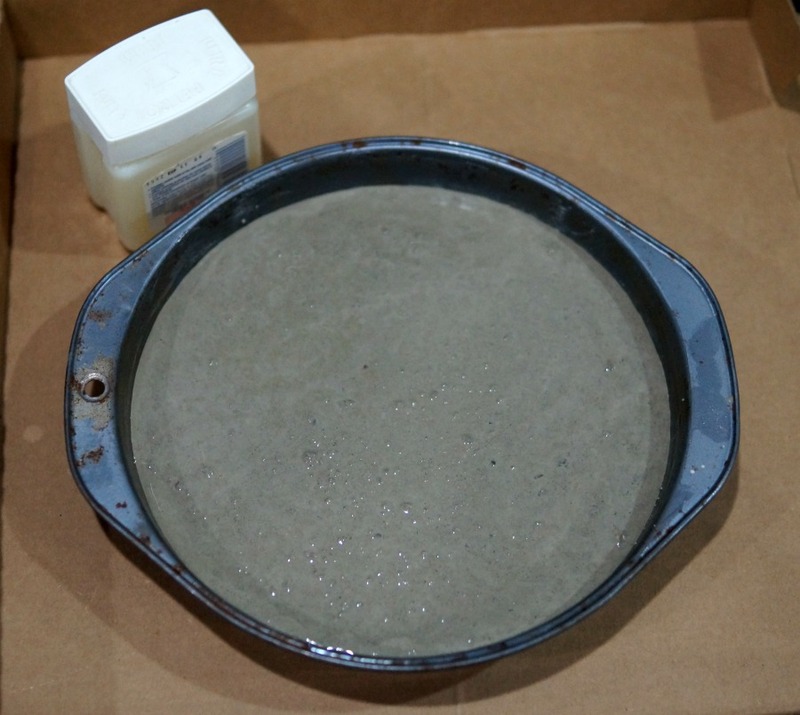 Allow a couple hours for cement to set before removing from the pan. Let the cement stone dry for a day or two before painting. 4. Mix together Night Sky and Cotton Ball acrylic paint and basecoat entire stone. 5. 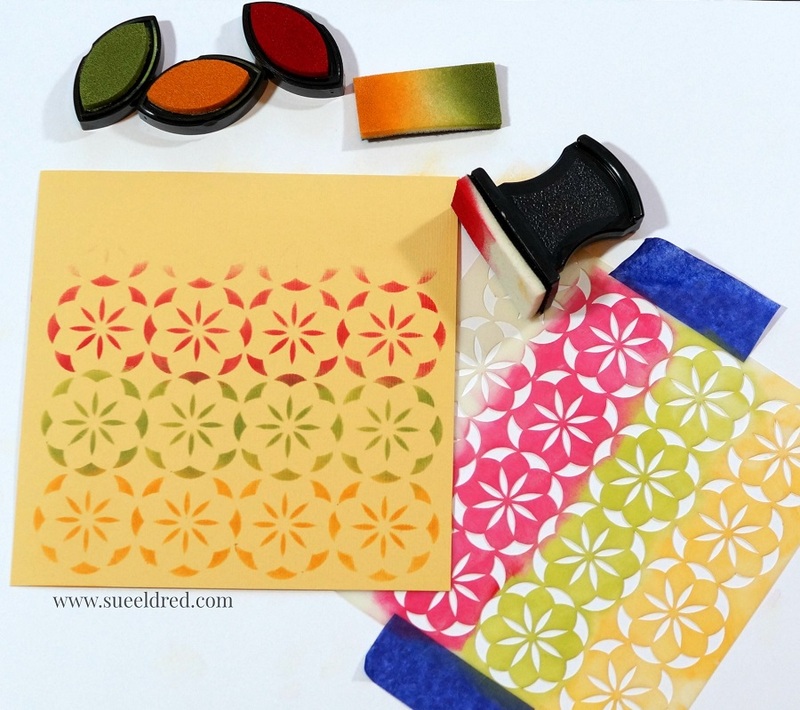 Tear a piece of white cardstock with an irregular edge as shown to create a mask stencil for cloud background. 6. 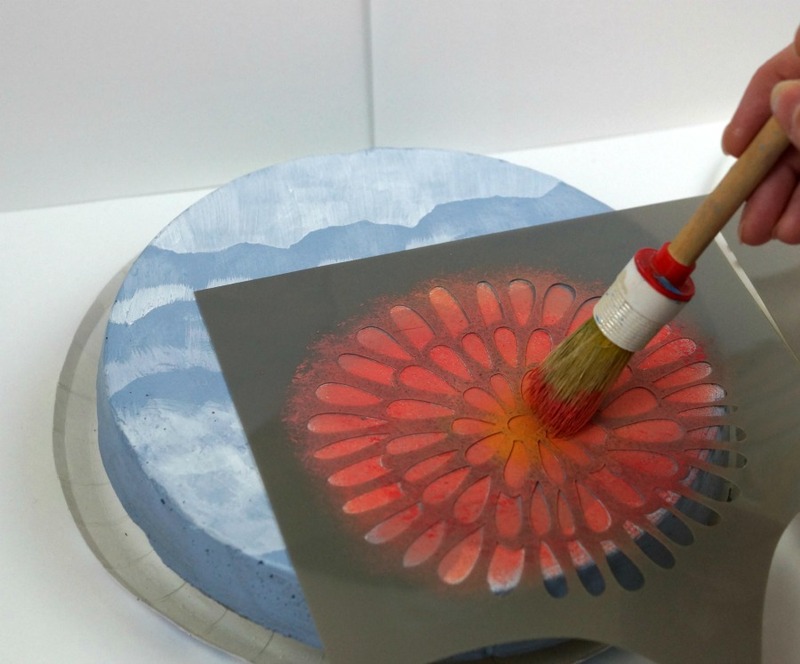 Place cloud mask stencil onto stone and paint with an upward motion. 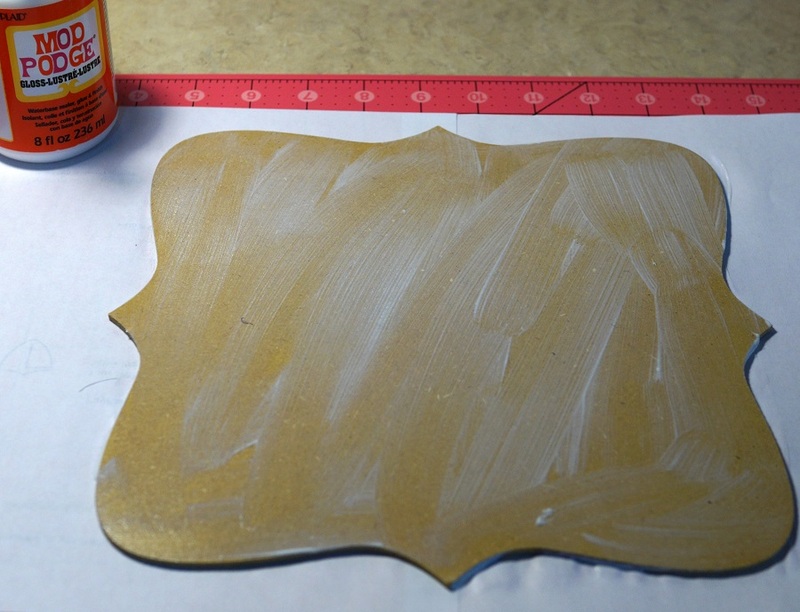 Move mask stencil around stone to paint additional clouds and let dry. 7. 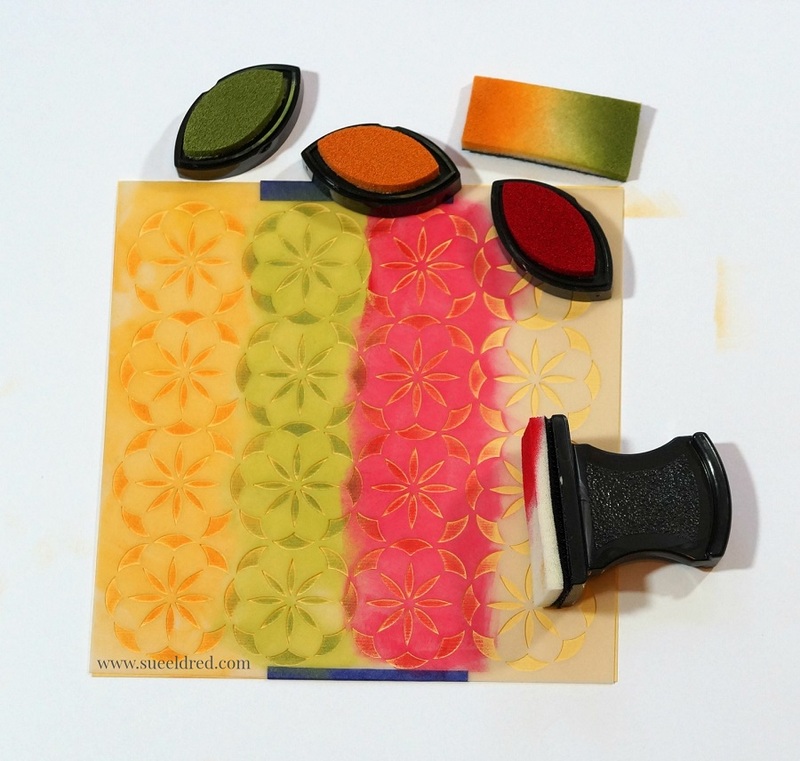 Stencil bloom flower using a mixture of Watermelon Slice and Marigold and stencil “bloom” with Night Sky as shown. Paint leaves Woodland Green and let dry. 8. Apply DecoArt Americana DuraClear Varnishes* using paintbrush over stone to help protect the stone from the outdoor elements. 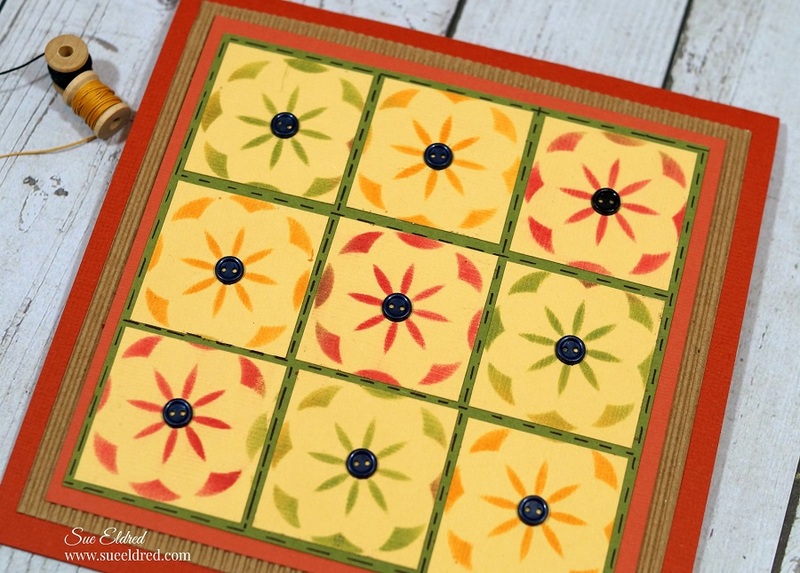 You also might like this stepping stone project I created with my grandson Nick. 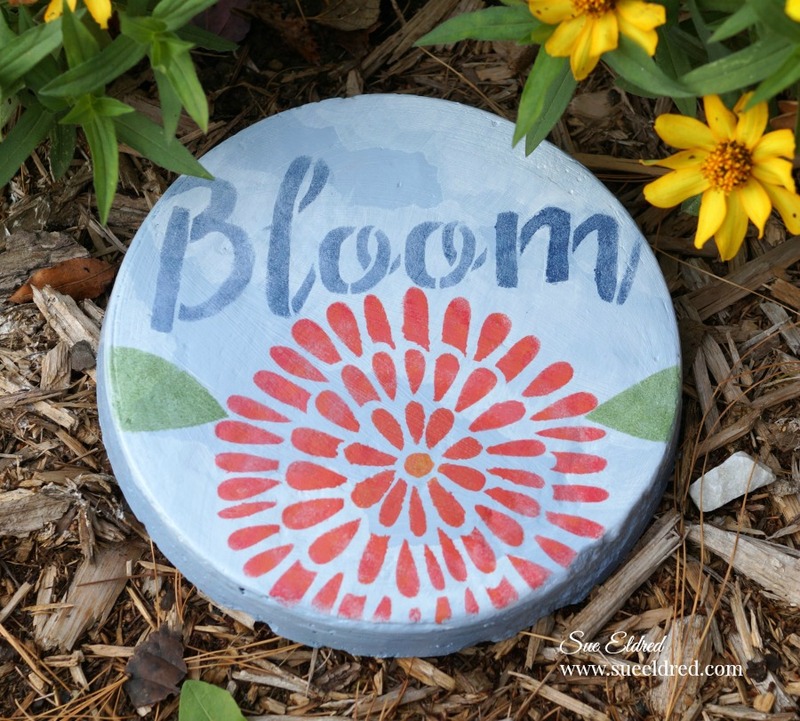 The Bloom Garden Stone was created for and sponsored by Craft Ideas Magazine. 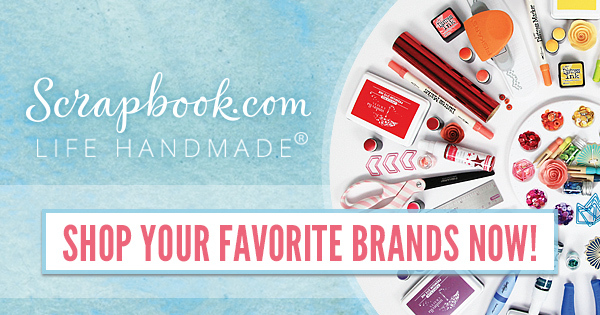 Craft Ideas for Every Occasion, Every Skill Level.